Initially cerebral hemispheres are to be studied under the heading of following gross surface features. 3 in numbers as follows. Temporal pole: It is the anteroinferior end of cerebral hemisphere. It is lodged into anterior end of middle cranial fossa. Embryologically, temporal pole is the posteriormost end of developing cerebrum, which is curved ventrally during rotational growth of brain. Occipital pole: It is the more pointed posterior end of cerebral hemisphere. This pole lies beneath occipital bone a little superolateral to external occipital protuberance. Frontal pole: It is the more rounded anterior end of cerebral hemisphere. It lies beneath medial part of superciliary arch of frontal bone. Primarily, cerebral hemispheres presents 3 surfaces. It is the convex and widest surface. Its convexity fits with the concavity of corresponding half of ranium. It is flat and corresponds to paramedian vertical plane. Most important features of this surface are: i. Compact section through horizontally running fibers in the form of ‘C’ shaped band with its convexity upwards. It is corpus callosum. Outline of temporal pole divides this surface into two parts. First, anterior: It is smaller and anterior to temporal pole. It is flat and called orbital surface as it rests on the roof of orbit formed by anterior cranial fossa of skull. Second, posterior: It is elongated and slightly concavoconvex lying behind temporal pole. It is called tentorial surface because it rests on a horizontal fold of dura mater (outermost covering of brain) called tentorium cerebelli. Borders are to demarcate (separate) adjacent surface. In total, borders are six in number. Before going to study and recognize the borders, readers are to understand following points. First 3 borders separate superolateral surface from medial surface (1 border) and inferior surface (2 borders). Next 3 borders separate medial surface from inferior surface. These borders together are known as inferomedial border. Superomedial border: It separate superolateral surface from medial surface. Inferolateral border: This border separates superolateral surface from posterior tentorial part of inferior surface. It extends from temporal pole to occipital pole. A little in front of occipital pole, this border presents a notch called preoccipital notch. Superciliary border: This is a small curved border which separates superolateral surface from anterior orbital part of inferior surface. Medial surface of cerebral hemisphere is separated from 3 components of inferior surface by following 3 borders. Medial orbital border: It separates medial surface from anterior, frontal part of inferior surface (orbital surface). Hippocampal border: It separates medial surface from middle, temporal part (hippocampal gyrus) of interior surface. 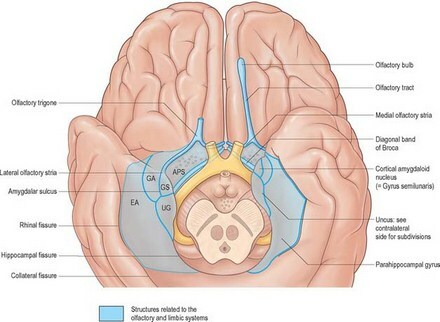 Medial occipital border: It separates medial surface from posterior, occipital part of inferior surface.